If I don’t die in the next two minutes, Blake thought, I have a pretty good chance of being alive at the end of the day. As a police detective, he was aware of the risk involved when interacting with the armed and dangerous criminal element of the ironically named City of Angels, but he was pragmatic enough to admit the most harrowing part of his workday was backing out of his carport onto that snaky ribbon of asphalt that was Lookout Mountain Avenue. When he had bought the house three years earlier he considered only two things, the just-shy-of-Olympics-sized swimming pool in the sunken back yard, and the record-low interest rates that meant his mortgage payment would be lower than rent on the elfin-sized West Hollywood apartment he shared with an actor-waiter hyphenate. The realtor had sucked the naiveté out of him the way a hyena does marrow, using words like “lush, tree-shaded seclusion” rather than the less salable “brush-fire hazard,” and reframing the house’s seediness as rusticity. She confided that an über producer had lived there before massive success propelled him out of hippy-dippy Laurel Canyon and into the more rarefied atmosphere of Bel-Air. Her proof was the image of the computer-generated dragon who had been the star of the producer’s first blockbuster movie, painted on the underside of the toilet lid in the master bath. 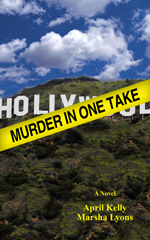 Having foolishly bragged about his new home’s pedigree at the station, Blake quickly learned there wasn’t a house, apartment, bungalow or hotel room in LA that didn’t claim at least a tenuous link to Hollywood legend, past or present. He didn’t care; he loved his home and had spent the last thirty-six months on do it yourself projects to soften its flaws and inch it back toward its glory days, circa 1978. The only problem Blake hadn’t been able to solve was the poorly designed carport. There were no sidewalks up in the canyon, and the impossibly short concrete ped went right to the road’s edge with no driveway at all. The carport was just wide enough that you could nose in two vehicles—as long as you didn’t try to open your doors all the way. Since the cramped space wouldn’t allow even the smallest of wheel bases to negotiate a three-pointer, and because the house was situated just south of the hairiest of the many hairpin turns, every morning Blake backed out blindly and hoped for the best. Today the man he had decided was a banker did not come hurtling down the mountain in his Hummer, cell phone in one hand, cigarette in the other, and Lord-only-knows-what steering that boat. No agitated soccer mom in her suburban assault vehicle careened around the hairpin, yelling at the kids in the back seat while trying to keep her coffee in its cup as the SUV tilted against the centrifugal force of the turn. And mercifully, not one of the future Indy 500 drivers attending Hollywood High was qualifying this morning. Hey, thought Blake, as he headed down the mountain, a quarter past five and no one has tried to kill me yet. He drove the tree-lined corkscrew down to the light at Laurel, where the lack of gridlock finally made him realize why this morning was different; he was leaving two hours earlier than usual, so the hookers, junkies and club zombies had just gone to bed, while the worker bees, tourists, and people of leisure hadn’t gotten up yet. Say what you will about the mass-death horror of a postapocalyptic hellscape, Blake mused, but the driving’s going to be sweet. Det. Blake Ervansky was on his way to pick up Sgt. O’Brien, his partner of less than twenty-four hours. Yesterday had been the last day for Artie Lafferty, his previous partner, and it was during the cake, coffee and gag-gift send-off party that the lieutenant had brought O’Brien in to be introduced. The subtle hiss that accompanied O’Brien’s entrance had been the sound of a man sucking in his gut, multiplied by a factor of every male cop in the room. In a city where the bar for beauty was set almost impossibly high, Sgt. O’Brien was a stunner. “Hey,” Blake said, extending his hand and getting a firmer handshake than he had anticipated. Sgt. O’Brien smiled good-naturedly as she shrugged and said, “Fine by me,” eliciting a few more responses from the entertained audience. Artie began making intros all around while Blake followed Lt. Rhee into his office. “Go ahead and shut the door,” Rhee said, settling into the chair behind his desk. Blake crossed toward the door, but just before he got his hand on the knob, the lieutenant spoke again. When Blake got back to the squad room, everyone had gone but Artie and Sgt. O’Brien. It was only a little after four, but the deets had gone home to rest up before their midnight rendezvous back at the station. Artie turned to leave, raising his right hand in a combination salute and wave. As Blake sat at his own desk, he couldn’t help but smile at the mental picture of this very Irish redhead in a flouncy wedding cake of a dress for the Hispanic equivalent of a bat mitzvah. The smile she flashed Blake was dazzling. Evil, but still dazzling.